There is a cute scene in The Clean Bin Project, when Jen laments about not being able to enjoy chips, and sets out to make her own. This is something that I encountered when I gave up plastic and general packaged foods. No more chips and no more crackers. 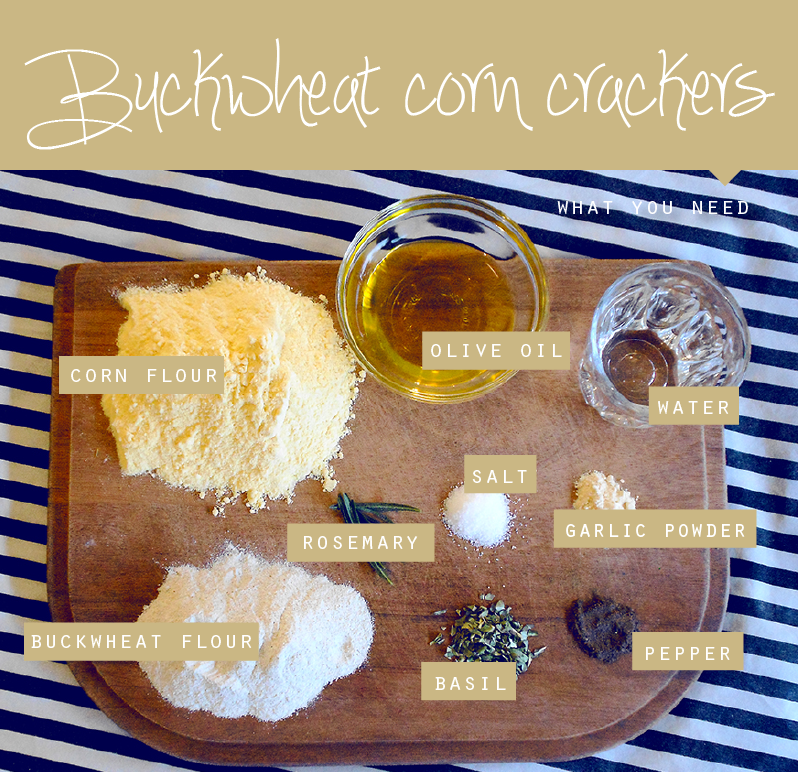 So I made my own plastic free, gluten free buckwheat corn crackers and they are yum! The Builder has an allergy to gluten. Now I don't live a gluten free existence. When we go out for dinner I get the bread basket to myself. Not the whole thing...well sometimes the whole basket. I can't just leave it sitting there tempting him. That is what you do when you are in love. Sacrifices people, sacrifices! 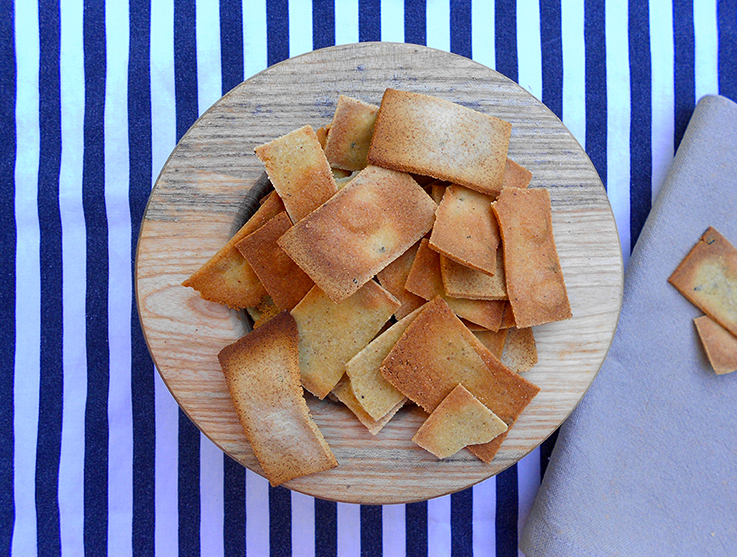 I made this gluten free cracker by chance with what was in my pantry at the time and have made it many times since. It has the Builders seal of approval. Plus you can mix in whatever seasoning to suit your taste. As with all my recipes I have bought the ingredients package free using my own containers and bags. Add dry ingredients to a bowl mixing well; Add a little water and the oil; Start kneading while gradually adding the rest of the water; Keep kneading until the mixture stops sticking to your hands. If it is still sticking to your hands add more buckwheat flour. If it feels to dry add more water; Let sit for 20 minutes; Turn your oven to 220 celsius; Grab your baking trays and rub a little olive oil onto them and put to the side; Once the dough has rested divide the dough into four separate balls and then begin to roll out – you can use a wine bottle, rolling pin, tortilla press or pasta machine; Once the dough has flattened to 3-5mm begin to cut out your crackers. You can do this in any shape you want; lay the cut out dough onto the baking trays and put into the oven for 8-9 minutes; Pull out, let cool and serve. I have made this recipe using paprika and onion in lieu of basil and rosemary. I sometimes sprinkle yeast flakes onto the dough before they go into the oven for a slight cheesy taste too. If you make the recipe I would love to know how you go in the comments below. If you liked this recipe please share it. 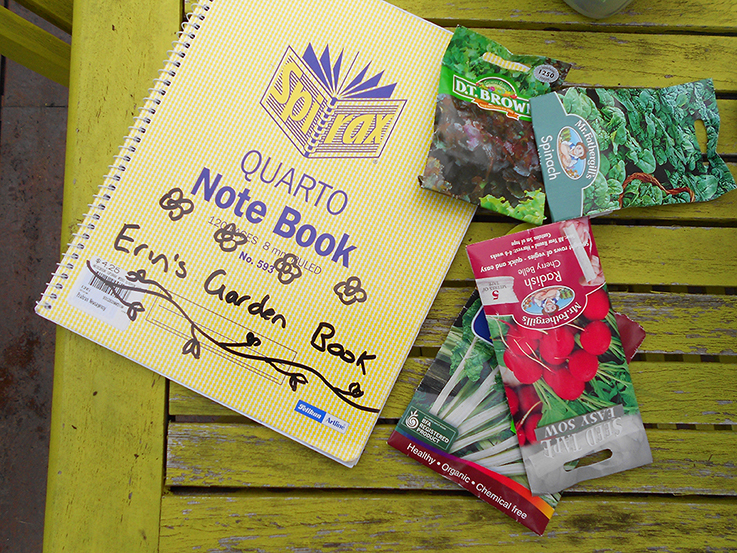 I have written about my garden but have shown. I took a couple photos before I jumped in and planted new seeds over the weekend. The space we have is small but I have not let that stop me from making something of it. Welcome to my garden patch. When the Builder and I first started dating two years ago he had only been in the house for a short time. He had landscaping done with a range of tropical plants and there were many balmy afternoons spent watering and caring for his plants to make sure they survived the summer. 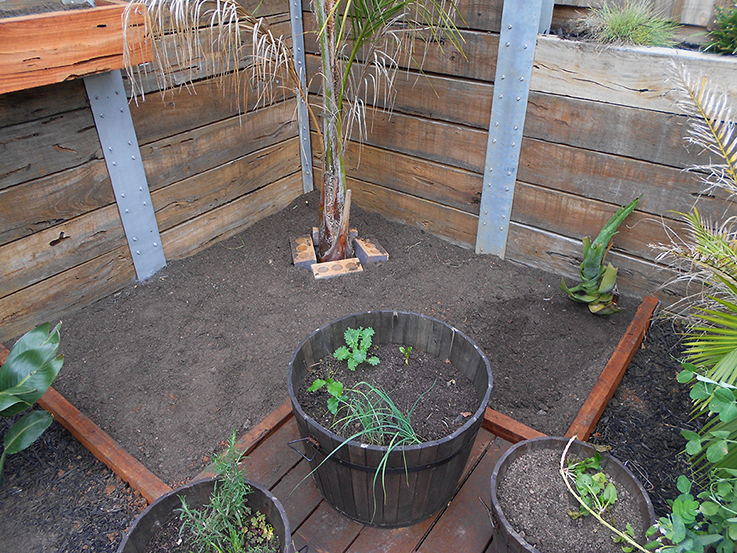 When I moved in late last year I began adding various sized wooden wine barrel pots and started growing vegetables. In fact the first birthday present I gifted the Builder was a lemon tree because he loves lemons so much. The guy will eat them like an orange! With the back wall and corner getting the most sun I was limited as to how much I could fit on the deck. 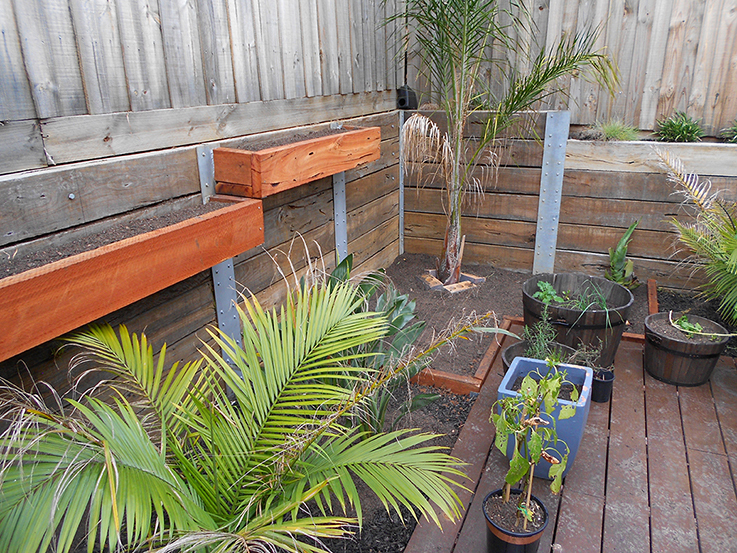 The builder decided to move two plants from the garden to add a raised garden bed. 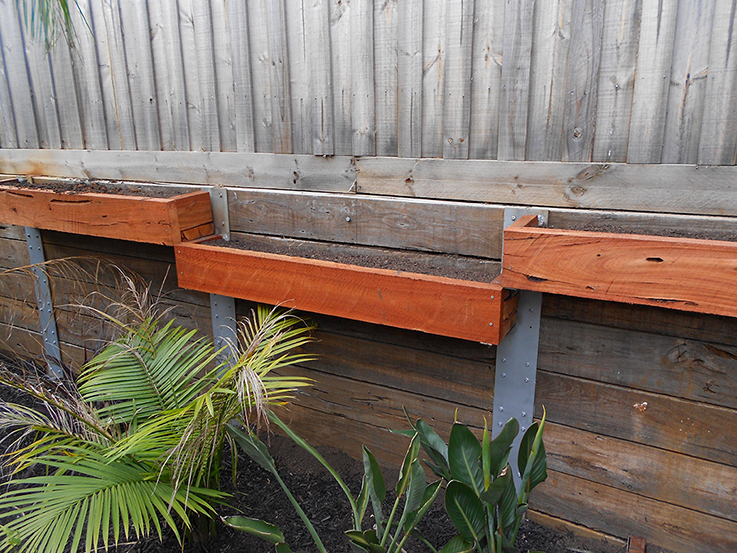 He then went on to build planter boxes coming off the retaining wall. Construction was completed two weeks ago and with blue skies this past weekend I jumped in and started planting. I was gifted an Aloe Vera and Silver beet plant. Both have found there way in and are looking good. I also added more radish and expanded my lettuce into the planter boxes hanging off the back garden wall. The raised garden bed is now home to Kale, Snow Peas, Spinach and Chinese Broccoli. 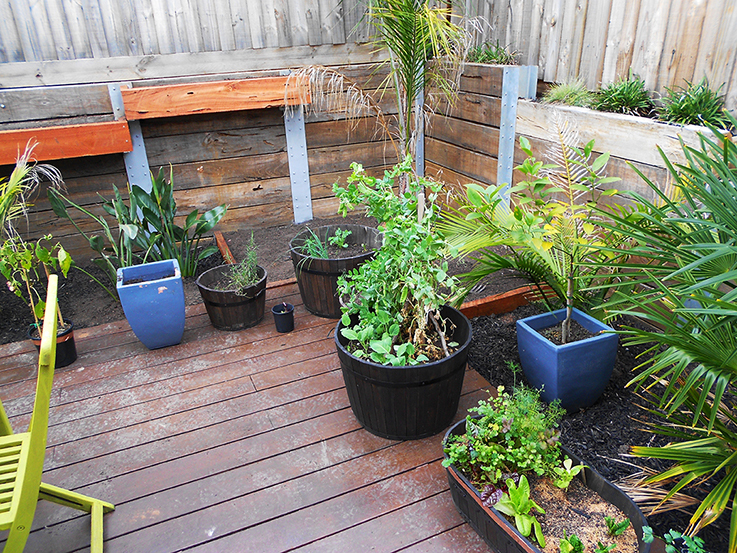 The pots have a variety of plants that need to be moved about or removed. 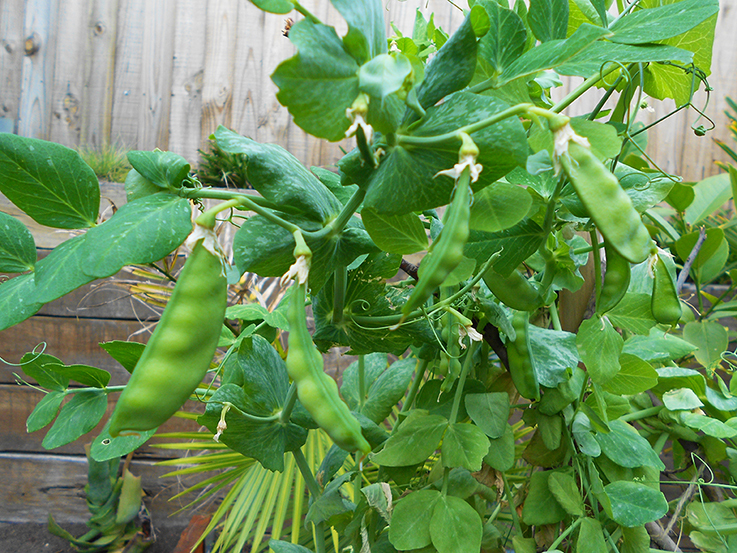 I already had four snow pea plants in a pot and are producing lovely sweet morsels. The radish were harvested this weekend too and have been added to my lunches for the week. 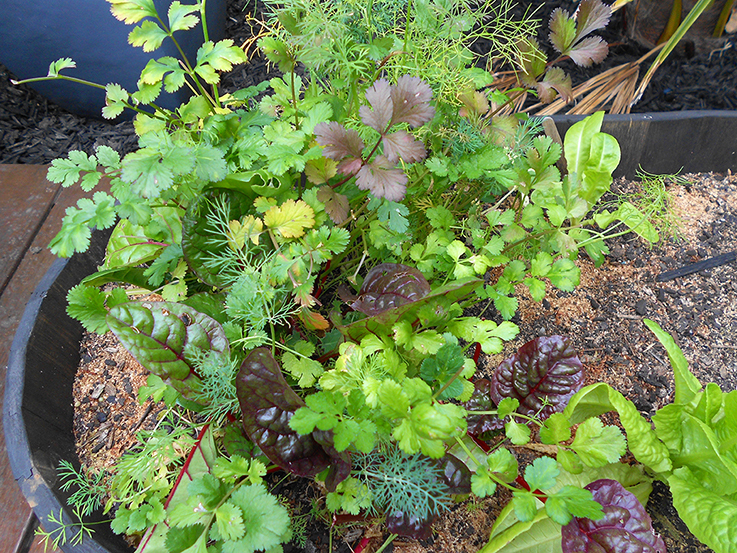 My favorite crop is my Horta mix. I keep track of what is planted and how it is going in an old note book. While it would be great to replace the various birds of paradise and palms with vegetables, I simply can not do it. Especially when I know how much effort and time went into getting it established. 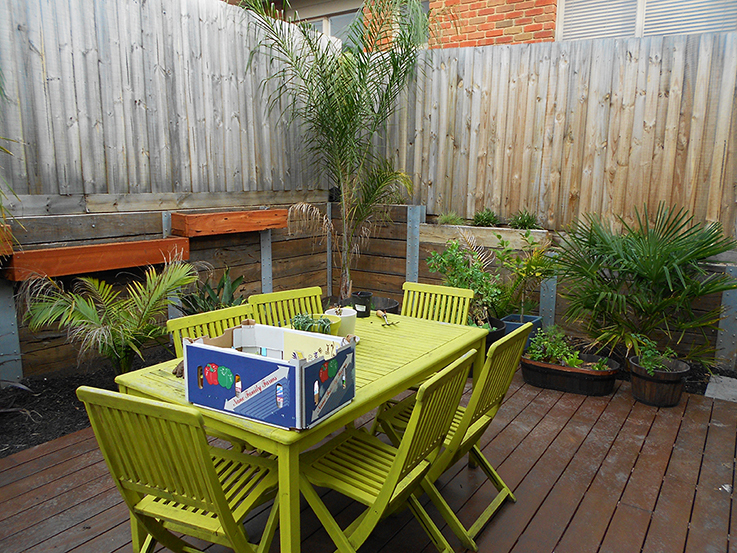 I have plans to put pots in between plants and utilise as much space as the weather warms up. Hope you have enjoyed a peek into my garden. I will do an update in the spring as I am sure I would have put more plants in by then. Over the weekend I visited a bookstore in Sydney. It was a expansive space that would make any bibliophile happy. I wove through the aisles peering at the names of titles looking for the sustainable living section. For the size of the bookstore I hoped that there would be a plethora of green titles for me to gaze at. Instead there were five books and none of them Australian based. I usually shop at second hand book stores and understand if there are less than ten titles on a particular subject. I used to work at a second hand bookstore; I understand that genres will be greatly limited. But a book store that catered for the new with next to no books on green living left me feeling deflated. While the internet is great, sometimes I have the same limitations as I did in the bookstore. The internet does serve as a great way to gather information and I have been inspired greatly by it. But many digital sustainable resources are not based in my part of the world and sustainable stalwarts prefer the local answers to local questions. Questions like, where to find local milk in a glass bottle or where to buy plastic free flour. The essence of sustainable is supporting local business and buying local goods that have not had to travel a long way. When I first started on my journey I had moments when I wished a group existed in my area that I could turn to with a problem or tell someone my latest find. A year on, I still wish this existed. So instead of waiting I decided to start a group for people that live in Melbourne and regional Victoria that want to connect with like minded plastic free living buffs and relatable discussions on sustainable lifestyles like zero waste living. A community space for people that live in Melbourne and regional Victoria. Share your plastic free life here. This group also caters for zero waste enthusiasts and related sustainability devotees as plastic free living overlaps or leads into these lifestyles. Basically it is a support group for plastic free living, zero waste and sustainable living specific to an area. I ask that you join, share your knowledge, ask questions and help get a community going. The sharing economy is happening on a small and large scale. Without a doubt the movement is expanding. The sharing economy, also known as collaborative consumption, is all about sharing items for other people to use, take off your hands at no cost or sometimes a small fee. The idea is based on community based living and is the resurgence of a centuries old community pillar. I wonder what the number in Australia would be? As the 'sharing economy' gathers more active members it will hopefully help alleviate product waste. It is a system that works both economically and more importantly environmentally by moving items from a linear process and into a cycle. 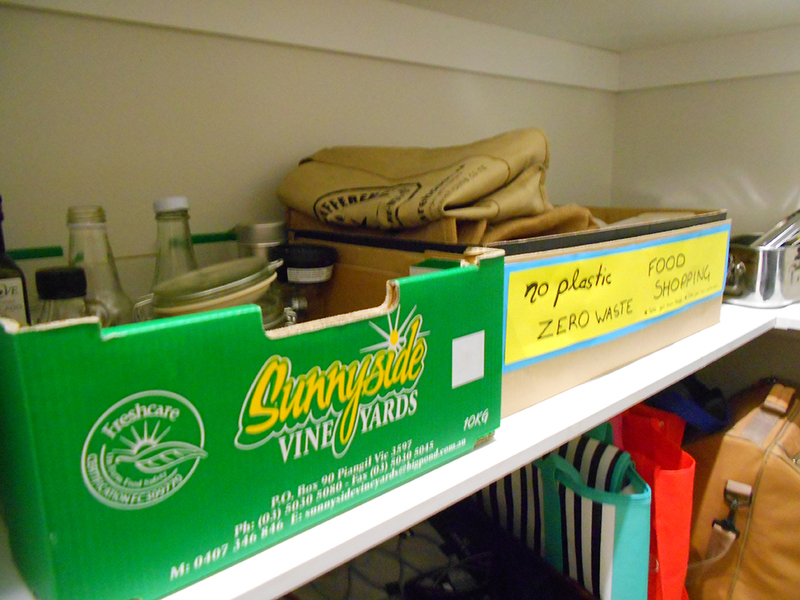 Sharing is a key component of not only zero waste living but also fundamental sustainability. Here are my top five sharing websites for finding that thing you need for free plus one easy idea too. Over the weekend the Builder had soil delivered to the house. 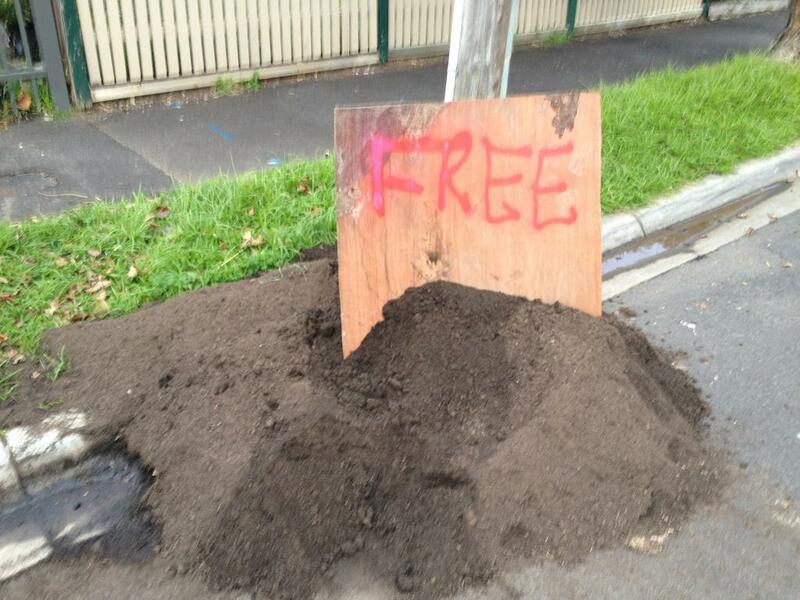 There was left over soil from his project and he decided to give it away for free. Within hours of him posting the advert (see his beautiful photo below) to Gumtree the soil was picked up. Sign up is completely free and is geared mostly towards recycled products, amongst others. If you are looking to create space by getting rid of that rice cooker, have spare photo frames you would like to pass on or baby gear then sign up to TuShare and put them onto the free market. Users can choose to arrange free pick up or pay door-to-door delivery. The website is a breeze to use and is free. 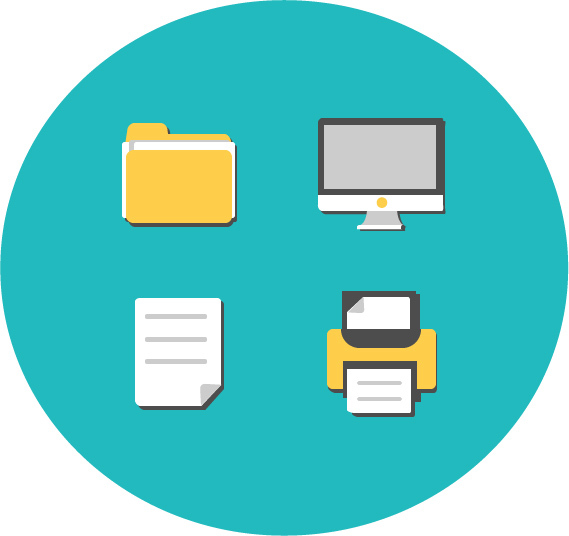 Users can either share or rent items that they have or need. Available items can range from household gadgets to musical instruments. For example if I was having friends over for a movie night I could rent a projector and screen. Users are required to pay a small fee to rent the items. The Free Cycle Network has been growing a fan base of over 7 million members the last eleven years with a group base of over 5000. I am a member of the Melbourne group and receive emails daily listing wears that are on offer in my city. I have written before about my love for The Clothing Exchange events. They are also online offering users an interactive space to swap clothes. 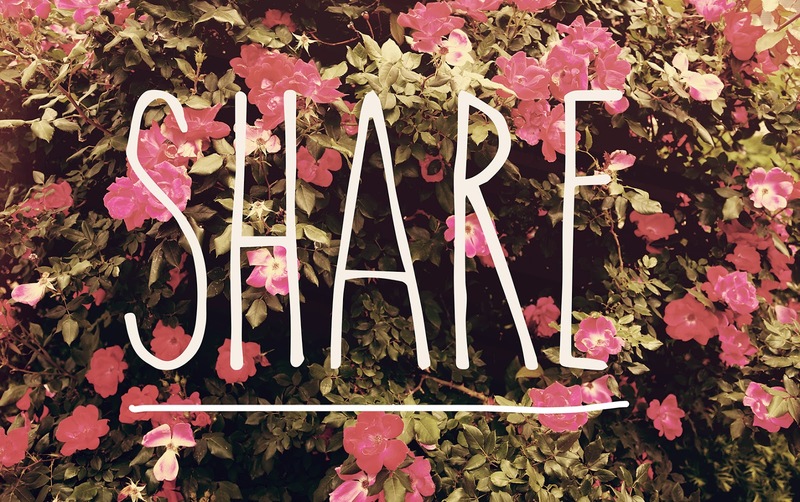 Read more about them in this blog post about sharing. Bonus! Another way to find a gadget is to ask your family and friends. Send out an email or a text; announce your request on Facebook. Through word of mouth I was able to get my hands on a food processor. 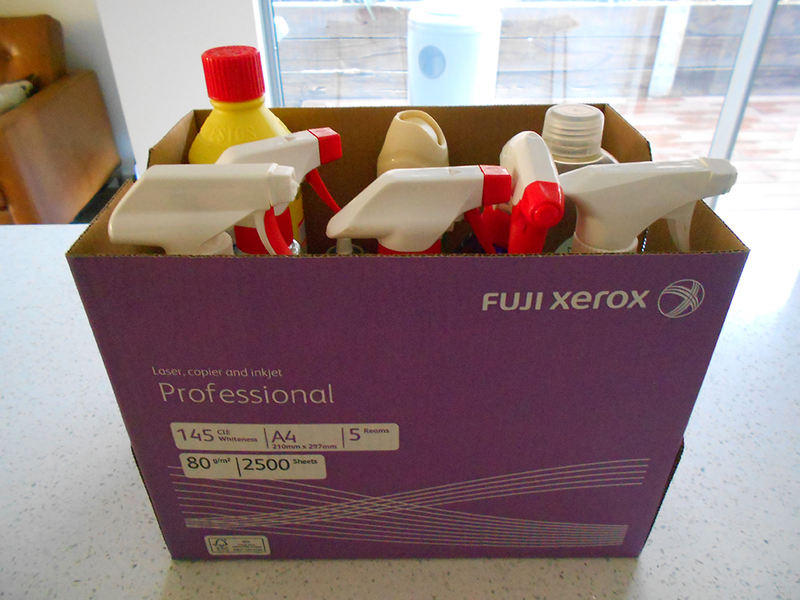 It alleviated the prior owner’s clutter in their kitchen and made my life easier. Have you tried sharing websites? I would love to hear your experiences in the comments below. My parents make growing vegetables so easy. They have a plethora of robust vegetables in their vegetable garden that continues to grow each year. So I thought that growing vegetables cannot be that hard right? Last year was my first year growing anything other than herbs and I thought I would jump in and pick a vegetable I really love: beetroot. 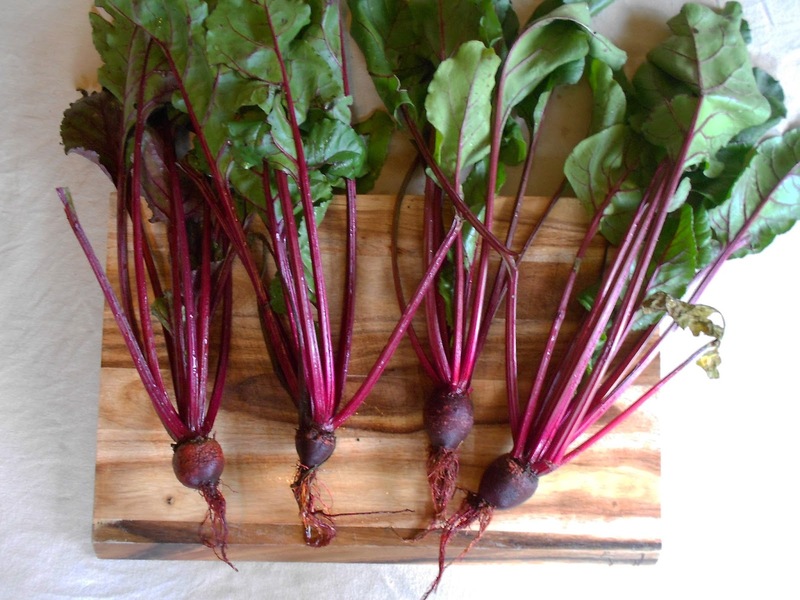 I was told my vegetable of choice was a little hard for a beginner but I turned my head up at the naysayers and went about growing my beetroots. I figured it was down to my lack of experience that led me to harvesting beetroots that were the size of a marble. I told myself that when I try again next year I would have a bountiful harvest. No such luck. I planted my seeds three months ago and the bulbs have again grown no bigger than a marble. Beetroot should be ready for harvest at 10 weeks. The leaves have done the complete opposite. While there was no large edible beet sitting snuggle in the ground for me to eat, the leaves were just to luscious to throw into the compost. So I decided to eat them! Warm up the olive oil in a pan and add the garlic. Cook for two minutes. Add the stems and toss around the pan until coated with oil. As the stems begin to soften add the beetroot leaves. Toss to coat leaves in oil. Cut the lemon in half and squeeze over the leaves and stems. Keep tossing the leaves until they have become limp. Pull of the heat and serve immediately. It is such an easy dish and is super tasty. It works great as a side for anything, especially fish. A pair of socks goes into our washing machine and only one of the pair emerges. A single mate. No other socks match up and it goes into a pile with the other lost cotton socks, unsure what to do with any of them. Does this ever happen to you? I have come up with a fun solution to recycle your socks by turning them into soap holders. 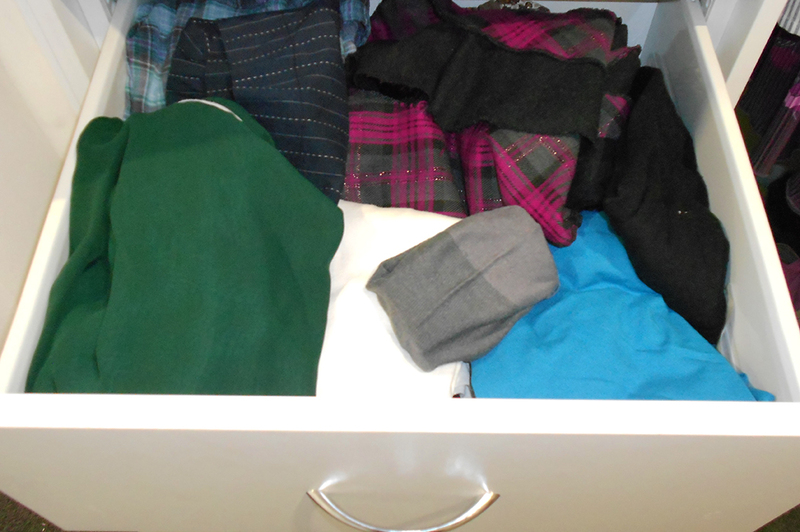 This easy tip will keep your clothes smelling fresh and help save on space in your bathroom. Since I choose to live a life void of plastic I choose to use shampoo and soap bars. I can generally buy these void of any packaging. A shampoo bar is one of the best ways to avoid not only plastic packaging but also packaging in general. I have been using shampoo soap bars waaaay back when packaging (plastic and paper) was of no concern. I first discovered them when I was living in London, hustling between Blighty and the European continent. They were just so versatile and weighed nothing. Plus there was the added assurance the bars had no way of exploding throughout my luggage! I recently converted the Builder to the wonderful world of package free soap. He took a container to the market and stocked up on All Australian Tea Tree from the Australian Natural Soap Company. I grabbed the Shampoo Soap. I also have a small selection of Tasmania’s Beauty and the Bees shampoo bars collected while I was visiting Hobart earlier in the year. If I find a place that sells shampoo soap bars, I will walk away with one. Let’s just say I have enough to last a year. It’s called bulk shopping for a reason because when anything of mine runs out I can’t just pop to the shops to pick up a bottle of shampoo. This lady has to be prepared! Rather than keep these blocks of gorgeous smells sitting under the bathroom cupboard I thought our clothes draws would be a better place to store them and free up space under the bathroom sink. Plus with them sitting in the draw they will keep my clothes smelling lovely. 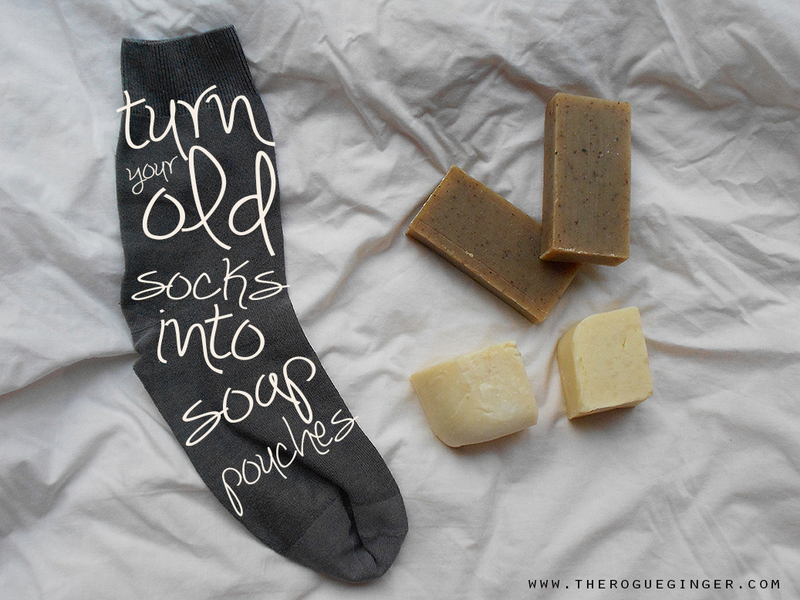 Rather than wrap in paper or risk them rubbing up against the clothes I decided to use old socks and repurpose them. I simply cut the sock in half and slide the soap in. It is so simple, right? The toe end will already act as pouch. 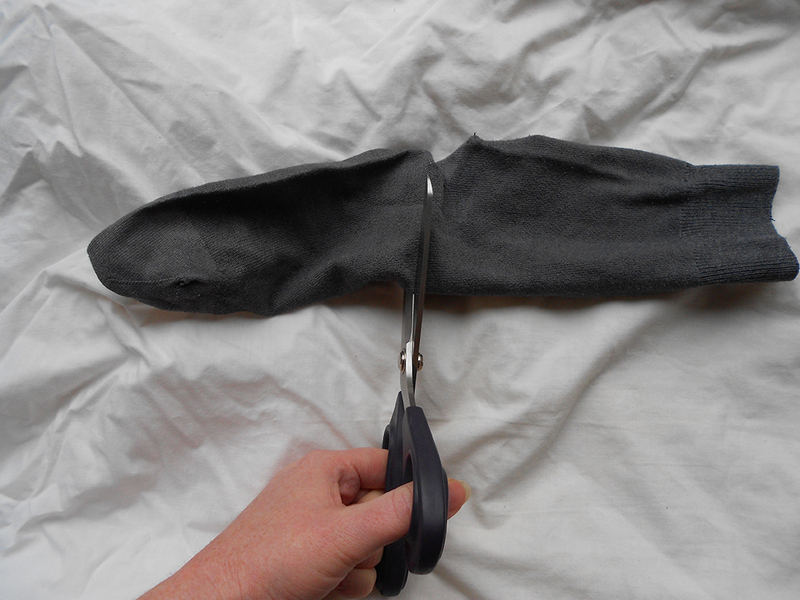 So as to not waste the other half of the sock (ankle end) sew up one of the sides, ready for another bar of soap. When I travel I keep one sitting amongst my clothes. This is a great way to keep the suitcase or backpack smelling fresh too. Living plastic free has evoked changes in my life. Along the way I have been called to question all that I was familiar with. 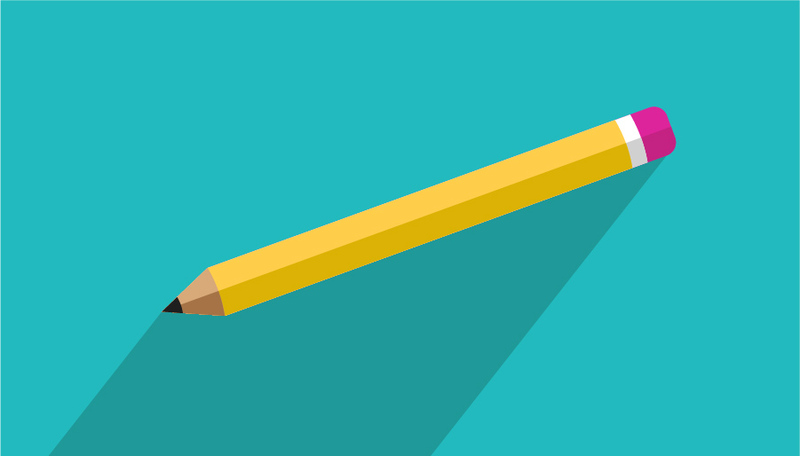 While blogs have provided a great resource for finding answers, sometimes I have needed to dive a little deeper to understand. Normally my literature choices hover around historical fiction or memoirs on rock and roll bands. So jumping into pages that study the misuse of our resources has been a change. A big eye opening change! Each time I delve into the green genre at second hand bookstores I get a tremendous urge to ditch my city life and build an eco-solar powered chemical free fortress away from everything. But that is not sustainable. It is way more sustainable to work with what you have and make better choices going forward – we don’t need more stuff! And that is what I learnt from my latest read The Story of Stuff by Annie Leonard. The story is cleverly put together and displays Leonard’s years of experience tracking trash around the globe. Her narrative explains in depth the linear journey of where stuff comes from and where it goes to die. The word Stuff being a collective summary of what we consume/purchase. She details her visits to factories around the world and the communities that are affected by our obsession for consumerism. Her stories of mines in Africa left me looking at my electronics in a different light. The humour and language makes the barrage of information accessible, offering not only an informative read but also very enjoyable. There are cleverly drawn images to break down the ideas further. I do wonder if I had read this as a teenager would I have been as free wielding with my cash in my teen years and early twenties. I don't think I would. The book stirred up a lot of emotions which I was not prepared for. Waves of guilt were felt and tears were shed as I read about the western worlds mismanagement and cluelessness. I had no idea how much my choices as a consumer could affect others. The author acknowledges the guilt and emphasises to not feel guilty about past choices instead focus on making better ones in the future. Leonard acknowledges it is hard to change habits. But by having the facts of where and how our stuff is made this powerful information alone will guide more people to make the right choice for the planet, those that make stuff and ultimately the consumer who uses stuff. It is about the power of knowledge and asking the right questions. This book is not anti-stuff. It is pro value for the stuff we have and the people that mined it and made it. There are many valuable resources in the book to help find information so we, as consumers, can make better choices. 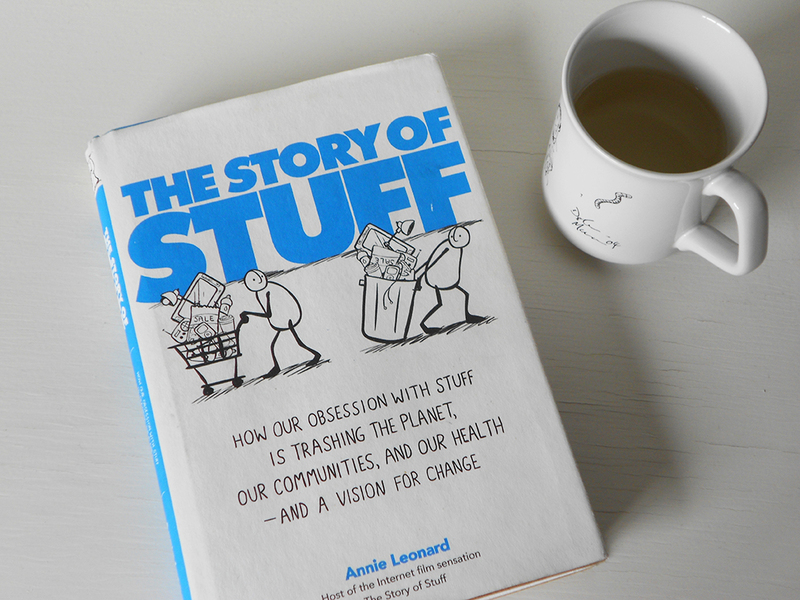 If you are not a reader then please watch the 20 minute documentary, The Story of Stuff. This is what kickstarted the book. 365 days have come and gone since I stepped up and announced that I would try to eliminate plastic from my life by taking on the Plastic Free July 2013 challenge. Once the 31 days were complete I was inspired to continue and adopt a plastic free life full time. Now I am more committed than ever. My life is not only about living without plastic; a result from schooling myself through documentaries, books, blogs and my own adventures. Along the way I have come to understand the toxic life consumerism creates and purged my life of unnecessary chemicals. I think harder about the amount of resources that goes into something as simple as a tea bag. To celebrate my plastic free anniversary the Builder and I watched The Clean Bin Project. This was the movie that sparked a green movement in my life. For all the greening in my life I have to ask; has my life become simpler or harder? Soap and shampoo have been combined. I now use a shampoo bar that I buy package free from The Australian Natural Soap Company sold at local markets here in Melbourne. Continuing to use the same razor I had last year. When it stops working I plan to replace it with this. Body moisturiser is coconut oil purchased in bulk using my own jar. Face moisturiser has been replaced with nourishing almond oil. I was using rose hip oil but found a place to buy almond oil in bulk purchased package free. Deodorant has been replaced with apple cider vinegar and water. The apple cider vinegar can be bought in bulk with my own bottle. I also use the apple cider vinegar to do monthly rinses on my hair. So versatile! Perfume has been replaced by essential oils that I buy from Perfect Potion. Unable to find essential oils in bulk I opt to recycle the bottles or find other uses for them. After no longer using perfumed products I find my sense of smell has grown stronger (and more sensitive to artificial smells too). I made this choice not because of plastic but to lessen my exposure to the weird artificial ingredients in commercial perfumes. Sanitary items like pads and tampons have been replaced. I have calculated that I have saved $145 in the last year. Make up has been replaced which I have detailed here. All products used to make my own makeup have been bought in bulk except for the activated charcoal for my mascara (recipe coming soon). Nail file currently using the same one I have had for years and years. I did buy a new wooden all natural hair brush that was sustainability sourced and made. I am still using my hair dryer and hair straightener I previously owned. I have stopped using hair spray and hair gels. I have bought new hair ties that I am aware have some form of synthetic material. I have saved three hair ties from various footpaths around Melbourne since I wrote about my new hair ties here. Just put them in the wash and they are clean clean clean! I take my own bags for grocery shop. No more plastic bags! And if we forgot our bags we will carry them by hand (the Builder is a pro at this) or find an old box at the store. I also use old produce plastic bags (old pasta, rice, cereal bags) at bulk food stores to collect beans, rice, flour, lentils, nuts etc. These were left over from when I did buy food in plastic packaging. Right now I am slowly swapping these out for upcycled cloth shopping bags. The old plastic bags will be recycled with RedCycle. I cannot wait for this to occur because it is not fun cleaning out plastic bags. But when you think of this…it makes it easier! I keep all of the items we need for a package free/bulk shop tucked away in box with the words 'zero waste plastic free shopping' labelled on the outside. 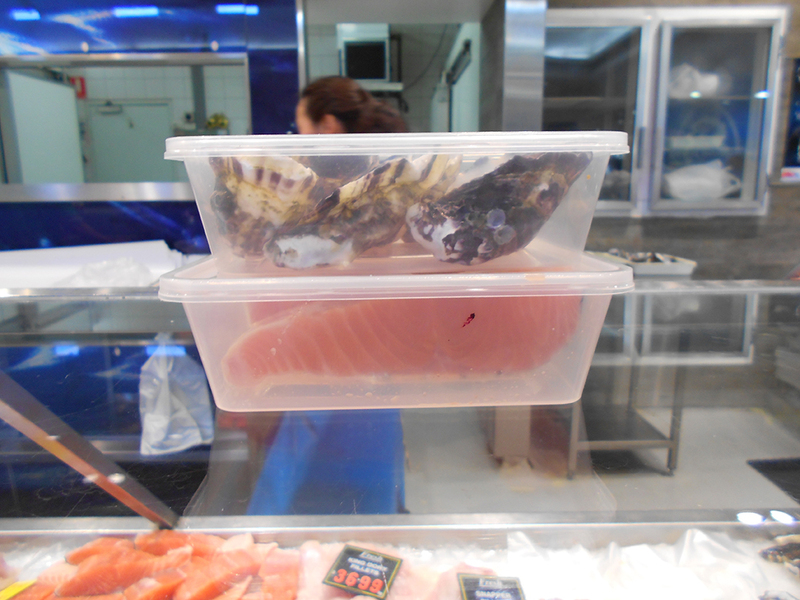 We use a mixture of Stainless steel containers and old takeaway containers to collect our meat and seafood. We purchased the stainless steel containers here. Our butcher and fish monger know the drill when we visit them. If we buy dips or cheese I take old take away containers. Some of them are getting to the end of their life and will be recycled. We are looking for replacements and think we will use these. Right now I hope they do not break as the counter staff at our local deli still has a hard time grasping the concept of bringing our own container and we are using their old containers...so giving them something like steel containers might cause trouble. Oh well, won’t be the first time. I will note that due to the Builders food sensitivities, eggs, gluten and dairy, we rarely buy these items. I buy bread occasionally for myself. Again I take my own cloth bag. If it happens a recipe calls for eggs then I will recycle the cartons in the garden when I need to sprout some seedlings. And as for milk I rarely need a recipe that calls for more than two cups so I just buy the smallest milk box at the deli and recycle. I drink tea (herbal) and the builder drinks coffee (long black). We can get all of these from our bulk food stores. I prefer not to use tea bags instead I use reusable cloth tea bags or a tea infuser. The builder and I no longer shop at any of the larger supermarkets instead opting to use local fruit and veg’s stores, butchers, bakers, delis, cheese stores, continental grocers, and bulk stores. Supporting small business and Australian farmers has been a great bonus that we love doing. 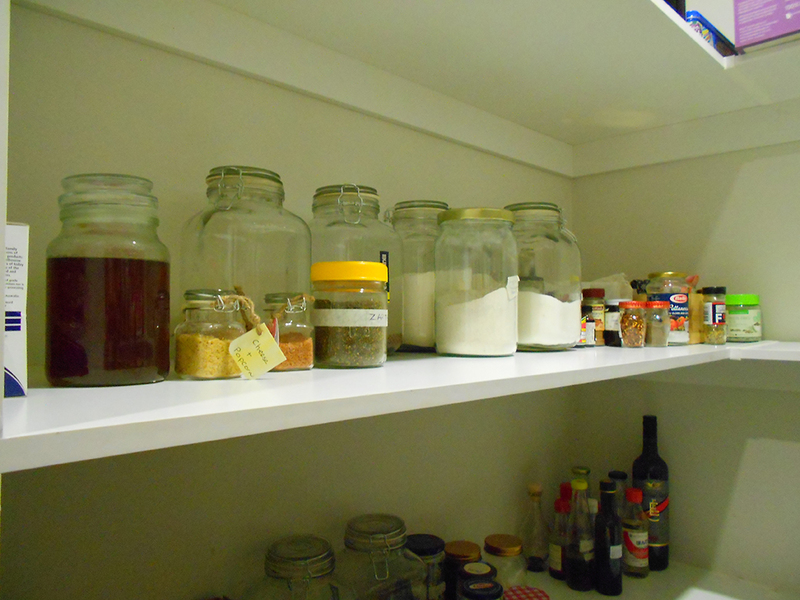 I store all items in glass jars that I have collected over the last year. I choose not to shop with glass jars unless it is liquid. It would be too heavy to carry home. Once I am home i transfer it all to glass containers. 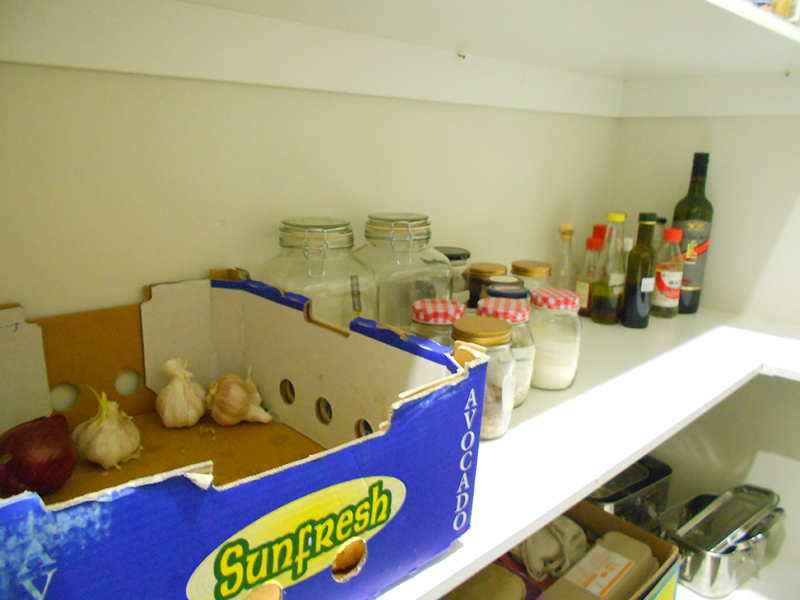 Food is stored in the fridge in either glass jars or on a plate/in a bowl covered with a tea towel. No more plastic wrap or plastic baggies in our freezer or fridge. I do have three plastic bowls and plastic utensils that I use for baking. I hope to swap these to wooden or metal instruments but this depends on what we find at the thrift store. It took me a year to find a second hand wooden rolling pin! Before that I was using an old wine bottle. We moved the microwave out of the kitchen and into the laundry. We have not microwaved our food instead choosing to heat it up on the stove top. Our housemate is the only one who uses it. The builder and I don’t miss it. We are trying to keep our appliance use down to a minimum. We compost everything except for onion and some citrus. I save the citrus in the freezer while the onion skin is thrown in the bin. We will either create new compost for these items (worms do not like citrus or onion) or find someone who can take it like a friend or relative. Currently we fill up our 5 litre bin each fortnight. We do have a housemate that does not follow our sustainability habits. As we are recycling more we have had to make space for containers to house our recycling goods before we drop them off. We typically use old boxes and label them clearly. Cleaning products like dish washing cloths are washed each week to prolong life. I also swapped for scrubbing brushes that will break down in the compost. While I was getting my education on about weird chemicals in makeup I was also getting a serve of knowledge about chemicals in general. We had a plethora of cleaning products that we decided had to go. We toiled about this decision for a long time as it was not a sustainable option to chuck out a product that had not been used up. But we figured it would be healthier to clean our house with kinder ingredients and so have stored them away until we can dispose of them correctly through a hazardous chemical disposal pick-up later in the year. 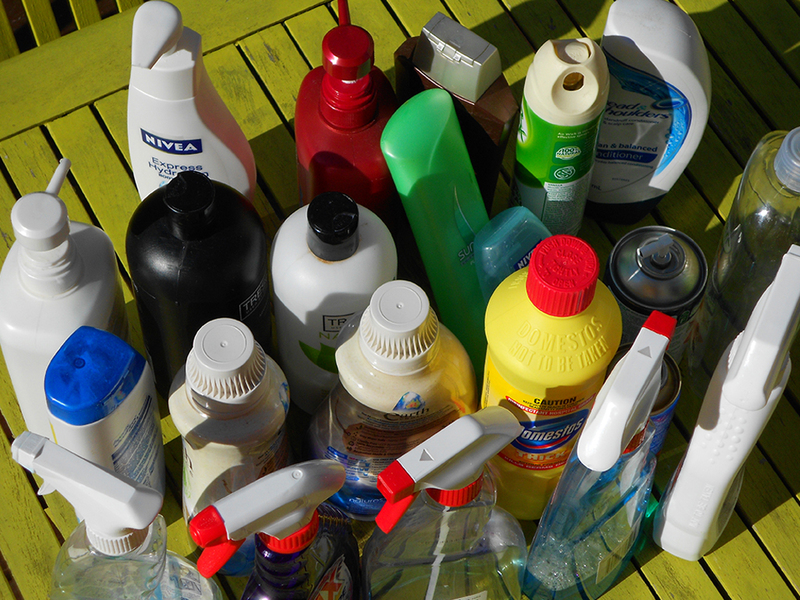 I will admit that we (not proudly) bought new empty plastic spray bottles that are reserved for home made and bulk bought green cleaning products. Currently we make our own window cleaner and will progressively move onto making all our own cleaning products. Let me say why we bought new bottles. The old bottles were full of harsh chemicals. You know the kind that warrant a toxic if swallowed label. Heck they need to be disposed of through a hazardous disposal system!! We just didn't deem it ok to mix any leftover residue with natural cleaners. We also had no other alternatives in the house spray wise so unfortunately new was our option here. I researched glass bottles but worried about them breaking. Since going plastic free and switching my life to glass there have been a couple of breaks which happens when a majority of the floors in the house are concrete and this ginger is a bit of a klutz. After we bought the bottles we realised we could use old wine bottles to house our cleaning products and make kitted holders for them so if they broke the glass would be contained. Hindsight is great. We don’t really shop anymore and when we do we will find great buys at our local thrift stores. But having said that I have bought one clothing item that is new and it was a beanie for the Builder that was Australian sourced, designed and made in Australia. We are not adverse to buying new clothing but is has to come from either Australian designed and made companies or if from abroad, a sustainable company that are not exploiting their workers or the environment. Plus we have way more fun in thrift stores and clothing exchanges. One of the biggest queries I get is how I make the time to buy all my food unpackaged, get organised for my shopping with different bags and containers, make my own makeup, make meals from scratch…. I am not going to lie... It was a challenge at the start and sometimes still is. I did cry once. The Builder and I both learnt a lot. I remind myself that I am changing 29 years of habits. I have had a tremendous amount of support from family and friends. The biggest support has been from my partner, known on here as the Builder. He has supported me in a big way and made mammoth changes in his own life. Living with someone who suddenly renounces plastic is pretty big (well i think it is) and his patience as I waded through this journey has been unwavering and nothing short of amazing. So I tell people just that: It takes time, practice and preparedness. But then I tell them it gets easier because it really does. There is a great feeling knowing that after one year I only contribute one item to landfill (onion peels!). Everything else I buy is done using my own packaging or the packaging, if any, is recycled. The best part is that I have a bag full of new skills. These are skills our great grandparents lived every day. My cooking has improved (well, I think it has!). I know what goes into my body as I make nearly everything that I eat. Even if you put me into a health food store I would still prefer something unpackaged! I am also surprised at the money I have saved too and the ease of refusing anything that is not aligned to my beliefs. I can say my life is simple, now. The next challenge is to focus on improving my zero waste habits that have resulted from taking away plastic but to also look at the waste I create outside the home. It's not much, but there are some places in my life I can improve. And I look forward to sharing more on the blog. To the next 365 days.